Advertising spaces available on our Suppliers Links page! Screen shot of Supplier Links page with two advertising spaces still available (Click on image to go to page). ​"Thanks Roland, I have great admiration for your website and content, a great resource!" Are you a supplier of products to the water-from-air industry? Attract more traffic to your website and gain new sales prospects by advertising on our Suppliers Links page. This is the most visited page on our site with visitors from around the world. 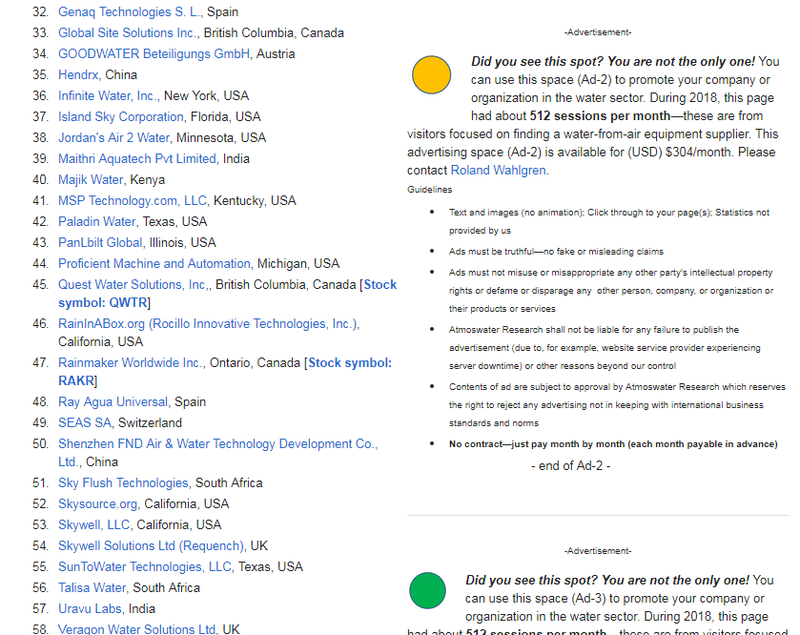 Faced with the list of 70 or so suppliers, people looking for water-from-air systems are a bit perplexed as to where to start their search for a reliable equipment source. It is easy to imagine they start by looking at who is advertising—advertisers have enhanced credibility. 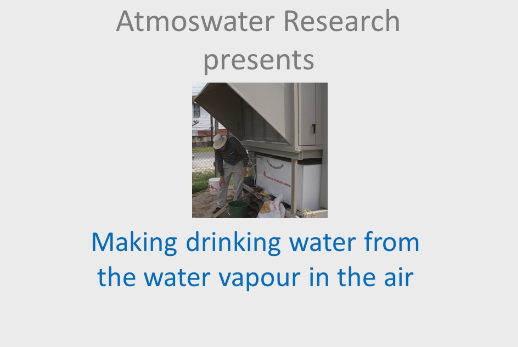 The Atmoswater Research website requires money and time to maintain and improve the content for the benefit of the entire industry. Advertising with us and purchasing our digital goods helps provide the financial support needed for long term evolution. A big thank you to our customers! Please contact Roland Wahlgren to discuss your company's plans for advertising on our site! Recently, the magazine, Inc., published an article about the Source Hydropanel manufactured by Zero Mass Water. A sidebar in the article said the device produces 5 litres per day of clean water and that the cost for each panel is USD 2000. A link to the article was posted on LinkedIn. A LinkedIn member wondered what would be the "levelized" cost of water per gallon. This blog post shows one method for answering the question. The spreadsheet shows that direct capital cost is only part of the equation. But, for a quick analysis let us proceed with the bare bones information in the Inc. article. For a 10 year equipment lifetime, cost of water (USD) is $0.41 per gallon. 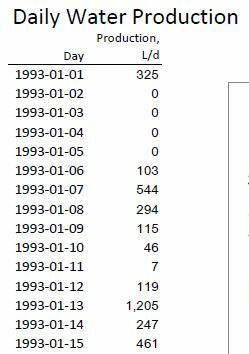 For 15 years it is $0.28 per gallon and for 20 years it is $0.21 per gallon. McDonald and others (2014). Water on an urban planet: Urbanization and the reach of urban water infrastructure. Global Environmental Change 27, 96–105. This paper gives the results of the first global survey of the water sources for the world's largest cities. Table 2 in the paper lists the largest cities enduring water stress. 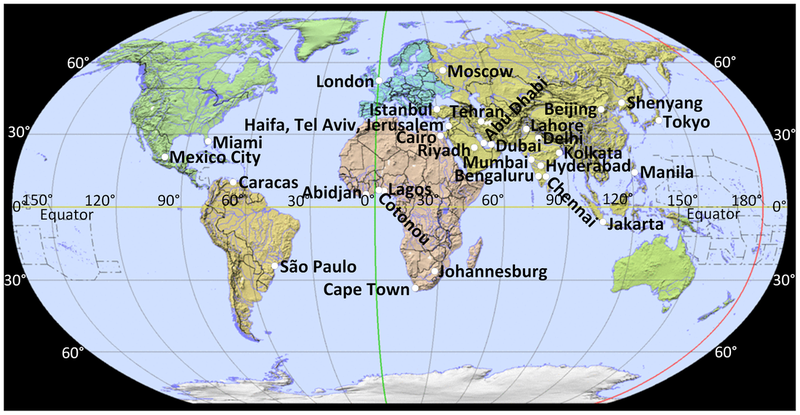 The cities (in order of population) are Tokyo, Delhi, Mexico City, Shanghai, Beijing, Kolkata, Karachi, Los Angeles, Rio de Janeiro, Moscow, Istanbul, Shenzhen, Chongqing, Lima, London (UK), Wuhan, Tianjin, Chennai, Bengaluru, and Hyderabad. Enjoy watching our 4 minute 40 second video presentation about using mechanical dehumidification technology for obtaining drinking water from the water vapour in the air. To access the video, just click on the image above. 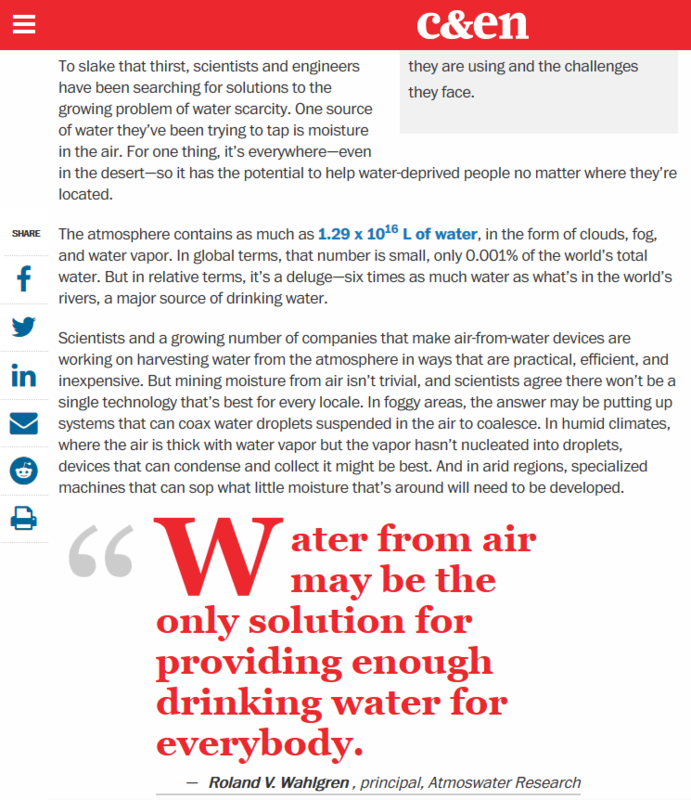 Chemical & Engineering News published an interesting article about drinking-water-from-air technologies which may be accessed at ​by clicking on the page excerpt image above. The September 28, 2018 earthquake and tsunami disaster in Palu has caused shortages of clean water (see for example, "Palu earthquake, tsunami victims get clean water support", The Jakarta Post). The Water-from-Air Resource Chart for Palu is a free download. This article is a nice up-to-date review about water-from-air technologies. Tim Smedley, the writer, interviewed me about some of the information that appears in the article. You can find the online article by clicking on the image above. ​For blog readers who may relish a scientific conference about water—The Welch Foundation Conference on Chemical Research "Water: Science and Technology" will take place in Houston, TX October 22-23, 2018. I am going! You can learn more about the conference at http://www.welch1.org/conference/conference-program —be warned— the experience will likely be similar to attending university lectures in chemistry and physics! Water-from-Air Quick Guide updated July 2018! In response to a reader's comments, the July 2018 reprinted second edition incorporates enhanced temperature versus relative humidity psychrometric tables in Chapter 4 with wider temperature ranges (0–55 °C; 32–132 °F) for finding water vapour density, humidity ratio, and dew-point. This makes the tables more useful for cities like Abu Dhabi, Doha, and Dubai. This reprint also has a revised Appendix 6: Economics of Off-grid Solar PV for WFA. There are two detailed examples in the Appendix. The first example is for a 1.05 kW input power atmospheric water generator using 1-phase electric power. The second example is for a 2.1 kW input power atmospheric water generator using 3-phase electric power.The Appendix presents clear diagrams showing the main components of single-phase and three-phase off-grid solar PV systems. 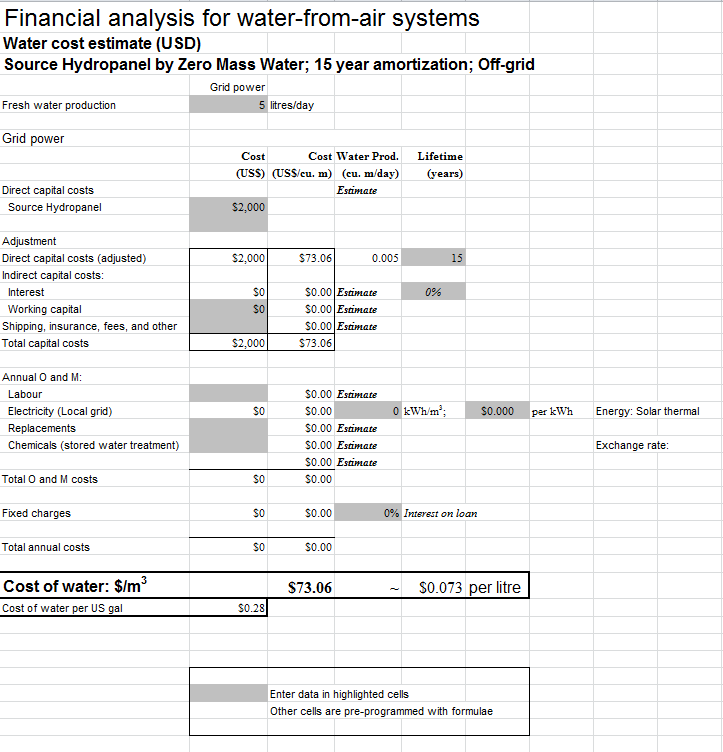 The Appendix concludes by revealing, for each example, the ratio comparing the price of an off-grid solar PV system to the price of the atmospheric water generator. The Water-from-Air Quick Guide may be purchased from Amazon. Did you know LinkedIn has a group devoted to the topic of Atmospheric Water Generators? It has 50 members at this time. The Group Owner is Stuart Shapiro, EVP at Infinite Water, Inc. I encourage anyone interested in the water-from-air field to join the group and contribute to discussions relevant to AWG technologies. The tables are for the dry bulb temperature range 0–55 °C (in steps of 1 °C) and relative humidity range 0–100 % (in steps of 10%). Moscow and London are among the 32 cities identified by the Nature Conservancy and the BBC as being likely to run out of sustainable drinking water supplies in the coming decades. Moscow and London among the cities that could run out of drinking water? Yes, according to a BBC report in February 2018. Moscow's drinking water comes mostly from surface water. Industrial pollution affects surface water in Russia. London has relatively low average annual rainfall feeding the Thames and Lea rivers which supply much of London's drinking water. Capacity limits are being approached and are likely to be exceeded in the next couple of decades. Although Moscow and London are not ideal sites for a year-round water-from-air resource, there is enough moisture in the air during the summer months to allow machines to operate. The new Water-from-Air Resource charts for Moscow and London, now available for purchase and download at the Atmoswater Shop, will be of interest to city planners and others concerned about ensuring water security for the people living in these two cities. 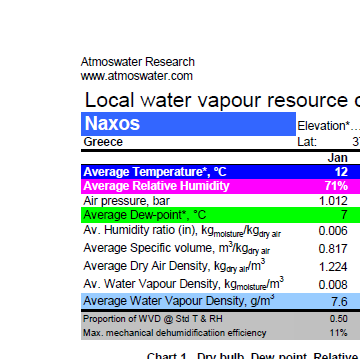 Snip of the Naxos water-from-air resource chart. Please click on image to go the the product page (opens in a new window). Recent headlines have highlighted the possibility of drought in Mykonos (Mikonos) affecting this Greek island, especially during the summer tourist season. Curious to know what the water-from-air resource is like in Mykonos, I created a chart summarizing the resource on a monthly basis. Because I could not find humidity data for Mykonos, the chart is actually for Naxos, 38 km to the south. 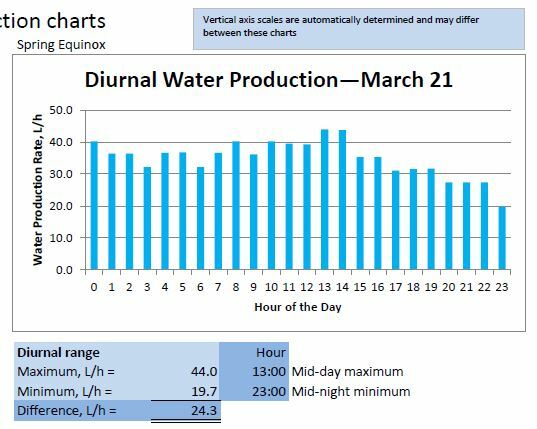 The chart, which you can purchase and download for the details, shows the water-from-air resource is good during the summer months and fair to poor the remainder of the year. ​Thermoelectric cooling technology has had wide appeal as an alternative to mechanical refrigeration cooling technology for at least twenty years. Thermoelectric systems avoid the use of hazardous, harmful refrigerants and noisy compressors​. Low coefficient of performance (COP, in the range of 0.9–1.2) is the main problem preventing widespread use of thermoelectric cooling especially for systems requiring large cooling capacities (Riffat & Ma, 2004). A COP of 1.2151, achieved using a multistage thermoelectric module, was considered "remarkable" by Patel and others (2016) Only smaller capacity niche applications have been commercialized. There have been several peer-reviewed papers published and patents issued for atmospheric water generators or dehumidifiers using thermoelectric cooling devices which use the Peltier effect. Some information and products have been featured on websites. Each reference below represents a clickable link to more information. Atta, R. M. (2011). Solar Water Condensation Using Thermoelectric Coolers. International Journal of Water Resources and Arid Environments, 1(2), 142–145. Milani, D., Abbas, A., Vassallo, A., Chiesa, M., & Bakri, D. A. (2011). Evaluation of using thermoelectric coolers in a dehumidification system to generate freshwater from ambient air. Chemical Engineering Science 66(12), 2491-2501. Muñoz-Garcia, M. A., Moreda, G. P., Raga-Arroyo, M. P., and Marin-González, O. (2013). Water harvesting for young trees using Peltier modules powered by photovoltaic solar energy. Computers and Electronics in Agriculture 93, 60–67. Nandy, A., Saha, S., Ganguly, S. & Chattopadhyay, S. (2014). A Project on Atmospheric Water Generator with the Concept of Peltier Effect. International Journal of Advanced Computer Research, 4, 481–486. Davidson, K. B., Asiabanpour, B., & Almusaied, Z. (2017). Applying Biomimetic Principles to Thermoelectric Cooling Devices for Water Collection. Environment and Natural Resources Research 7(3), 27–35. Reidy, J. J. 2008. Thermoelectric, High Efficiency, Water Generating Device. United States Patent 7,337,615. ​Waite, R. K. & Neumann, A. (2017). Water production, filtration, and dispensing system. United States Patent 9,731,218 B2. The "instructables" website published the article "How to Make a Dehumidifier (Thermoelectric Cooling) in 2016. Amazon.com sells several models of "thermoelectric portable compact dehumidifiers". Patel, J., Patel, M., Patel, J., & Modi, H. (2016) Improvement in the COP of Thermoelectric Cooler. International Journal of Scientific & Technology Research 5(5), 73–76. Thirty-two cities that have been identified as likely to run out of sustainable natural water supplies by the Nature Conservancy and the BBC (see text). Click on map to enlarge. The target market for atmospheric water generators, in the broadest sense, are people in locations with perennial water shortages due to population growth, climate change, and lack of enough sustainable surface or groundwater within a radius of 100 km. The reference for these defining conditions is: Lalasz, R. (2011). New Study: Billions of City Dwellers in Water Shortage by 2050; retrieved from https://blog.nature.org/conservancy/2011/03/28/pnas-billions-city-urban-water-shortage-2050-nature-conservancy/. A study led by the Nature Conservancy defined these conditions. At least 23 cities fit these conditions. From north to south they are: Shenyang, Beijing, Tehran, Haifa, Tel Aviv, Jerusalem, Lahore, Delhi, Dubai, Riyadh, Abu Dhabi, Kolkata, Mexico City, Mumbai, Hyderabad, Manila, Chennai, Bengaluru, Caracas, Lagos, Cotonou, Abidjan, and Johannesburg. Some small tropical islands such as Grand Turk, Turks and Caicos Islands and Sal Island, Cabo Verde also fit these defining conditions. 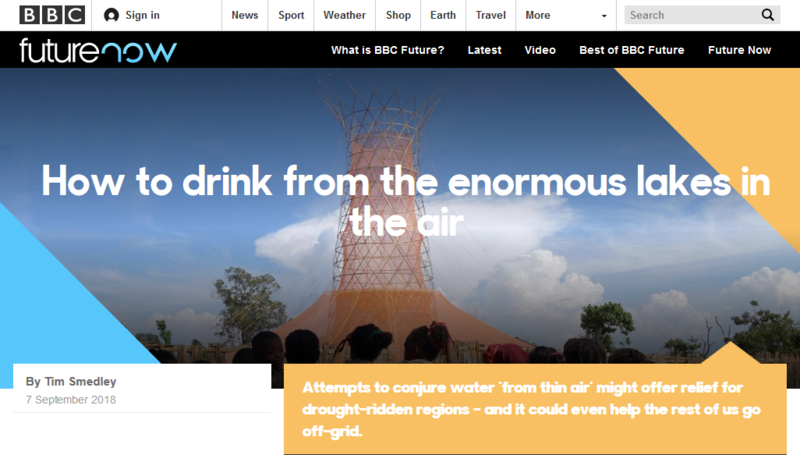 Recent reports such as “The 11 cities most likely to run out of drinking water - like Cape Town” by the BBC (http://www.bbc.com/news/world-42982959; 11 February 2018) suggest that we could add other cities to the Nature Conservancy’s list. From the BBC report here are nine more cities to add to the list of those likely to run out of sustainable natural water supplies: Cape Town, São Paulo, Cairo, Jakarta, Moscow, Istanbul, London, Tokyo, and Miami.Water-from-Air Resource Charts are available for all the highlighted locations mentioned in this post—just click on the location name to go to the relevant page in the Atmoswater Shop. By the way, if you like bargains, the charts for the 23 water-scarce cities listed by the Nature Conservancy are all included in the book, Water-from-Air Quick Guide. Several new water-from-air resource charts for cities in India are now available for purchase and download at ​https://www.atmoswater.com/store/c130/India.html. The cities include Bikaner, Dhubri, Dibrugarh, Kota, Srinagar, and Trivandrum. Beysens, D., Milimouk, I., Nikolayev, V. S., Berkowicz, S., Muselli, M., Heusinkveld, B. & Jacobs, A. F. G. 2006. Comment on "The moisture from the air as water resource in arid region: Hopes, doubt and facts" by Kogan and Trahtman. Journal of Arid Environments 67(2), 343–352. "…radiation-cooled light condensers are presently being used in Corsica island (France), Bisevo island (Croatia), Jerusalem (Israel) and Kothara (India)…" [at the time of publication in 2006]. #Water-from-Air Quick Guide: Second Edition now available! The Water-from-Air Quick Guide: Second Edition is now available from Amazon! 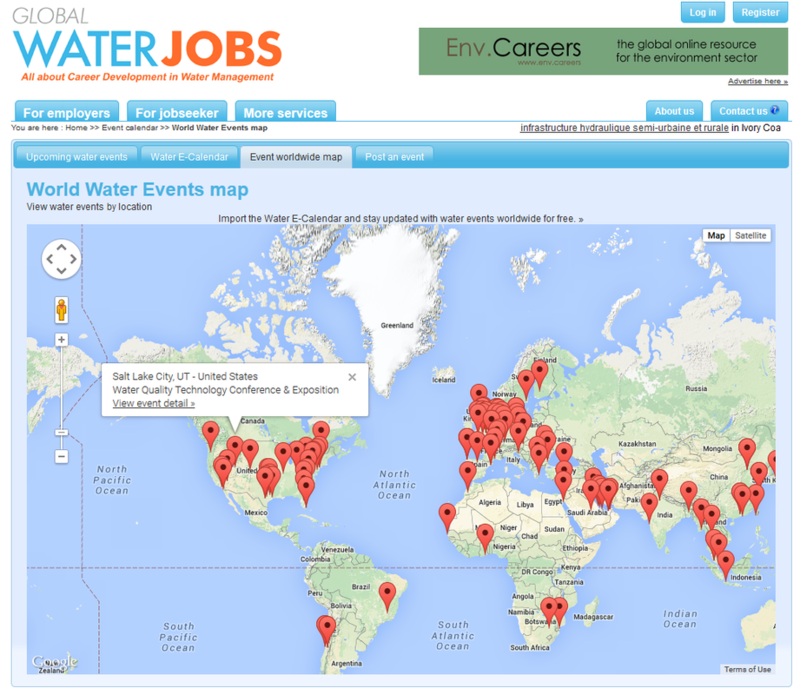 This useful World Water Events Map is available at the Global Water Jobs site. 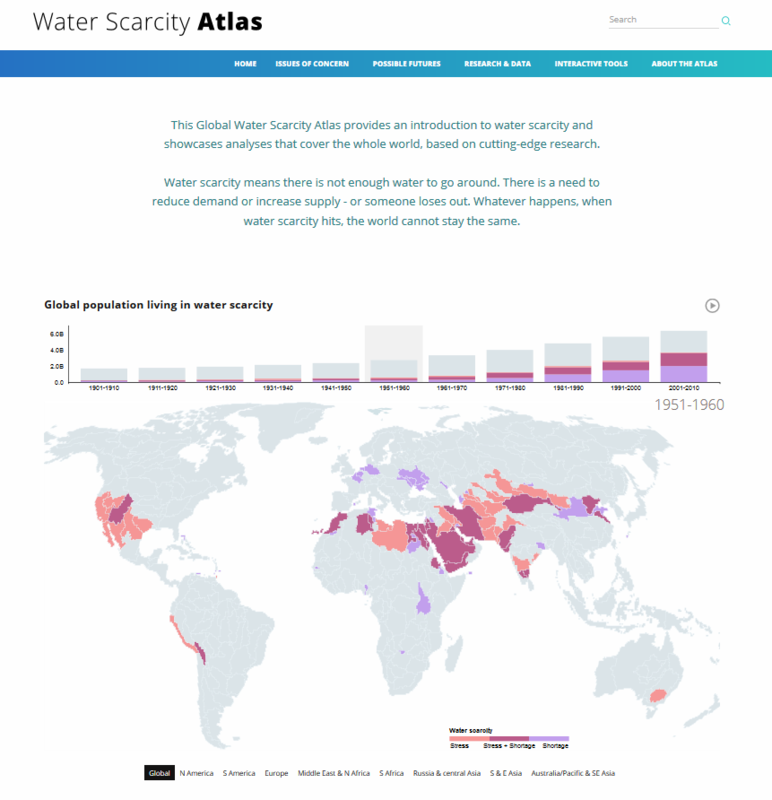 The site also lets you look at a list of upcoming water events and at a calendar of events. 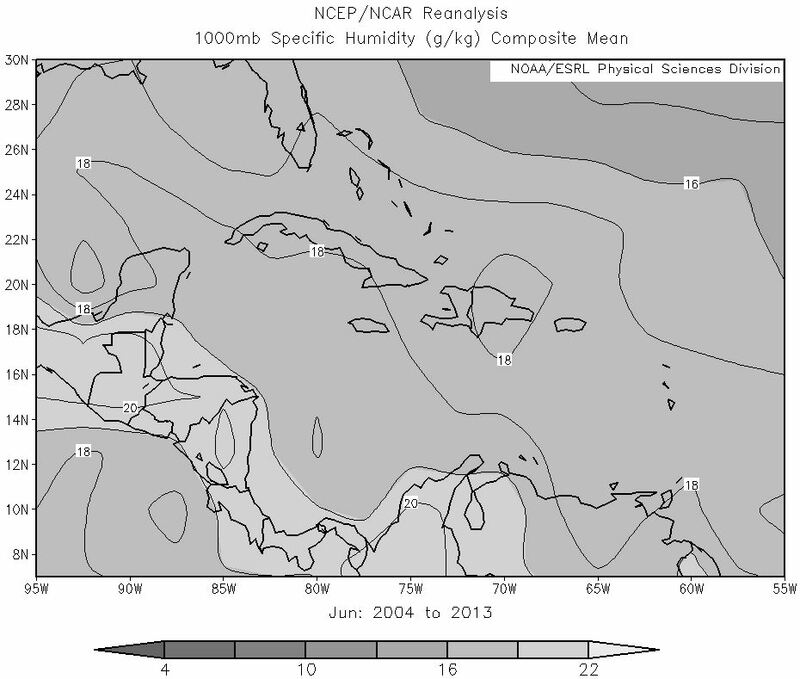 This is Figure 3 from the paper showing the Caribbean water-from-air resource during June. The resource is represented by the composite mean specific humidity for the ten months during 2004 to 2013. Image provided by the NOAA/ESRL Physical Sciences Division, Boulder, Colorado from their web site at http://www.esrl.noaa.gov/psd/; NCEP Reanalysis dataset (Kalnay, E. and Coauthors, 1996). Regional droughts in the Caribbean are common. Water managers seeking solutions to water scarcity are often unfamiliar with the option of using water-from-air technology. Maps of the specific humidity composite mean for Junes and Decembers during the ten-year period 2004–2013 quantify the water-from-air resource demonstrating it is suitable for operation of water-from-air systems in Caribbean countries. Quantitative investigations by the author found droughts and long-term climate change do not appear to affect the magnitude of the Caribbean region’s water-from-air resource. Case studies include one for a proposed water-from-air commercial greenhouse on Grand Turk. Another case is about the experience of commissioning a 2500 L/d water-from-air machine in Belize City. Lessons learned from the case studies are outlined. #CAdrought: What does the #water vapor density field for #California look like in August? August water vapour density field for California. Basis for image provided by the NOAA/ESRL Physical Sciences Division, Boulder, Colorado from their web site at http://www.esrl.noaa.gov/psd/; NCEP Reanalysis dataset (Kalnay, E. and Coauthors, 1996). Click on image to enlarge. Air masses with relatively high water vapor densities (exceeding 12 grams of moisture per cubic meter of moist air) surround San Francisco / San Jose and Los Angeles / San Diego. 'Good' performance is expected from water-from-air systems (atmospheric water generators) operated in these regions. Over the balance of the state, the water-from-air resource is graded as 'fair'. 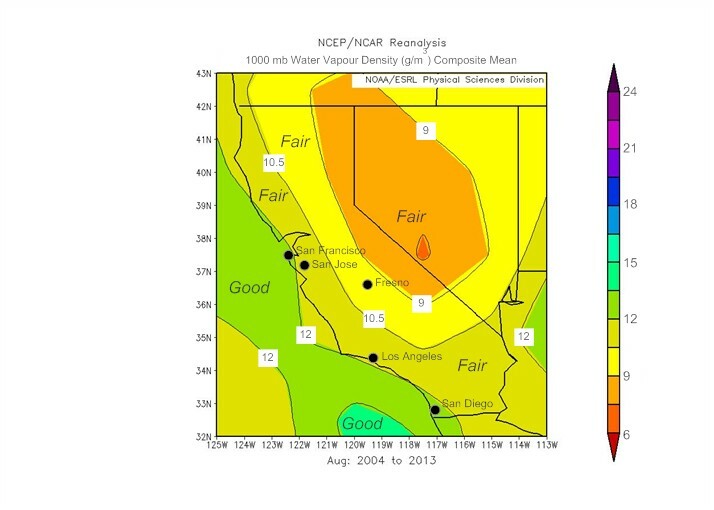 This map is from the new Atmoswater Research 45-page publication, Atlas of the Water-from-Air Resource for California. 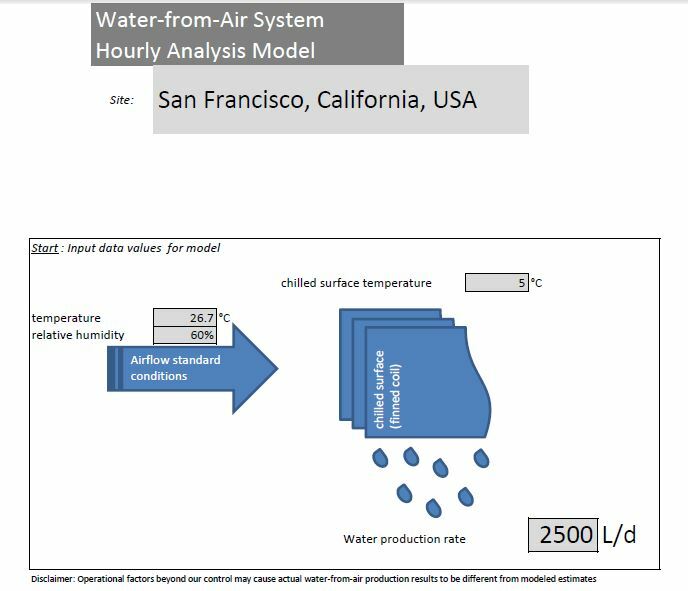 A Water-from-Air System Hourly Analysis Model for San Francisco, California is available as a free download on the Atmoswater Research website. During the prevailing California Drought, seventeen rural communities were identified by the California Department of Public Health as having "drinking water systems at greatest risk". Two of the affected counties, Sonoma and Santa Cruz are adjacent north and south respectively to San Francisco. 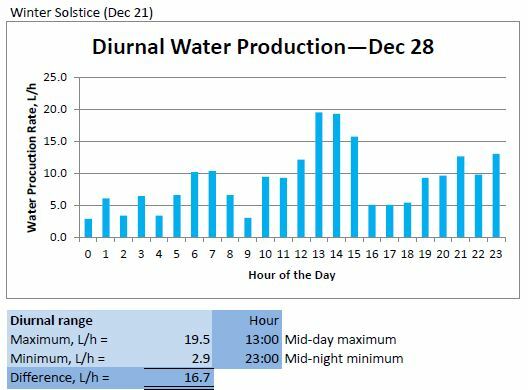 Therefore, it is interesting to take a tour through the San Francisco hourly analysis model to see what it can tell us about the feasibility of using water-from-air machines (atmospheric water generators) as alternative or additional water resources in drought affected communities in Sonoma and Santa Cruz. Tour Stop 5: With an average daily water production of 703 L/d, one machine could serve 14 people at the 50 L/d level or 140 people at the minimal 5 L/d level of drinking water consumption. Water storage is needed to distribute the annual water production evenly over the year. Several machines can be distributed throughout a region to serve larger populations. Water-from-air is a unique decentralized way of obtaining water. It is not absolutely necessary to think of a central water production hub. The machines can be placed where they are needed. 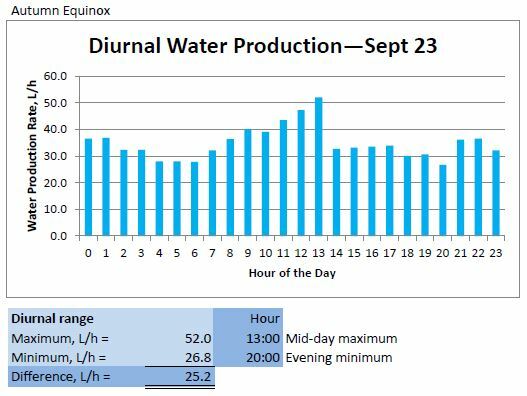 Tour Stop 7: This is an excerpt from the daily water production table that is generated from the hourly weather data. 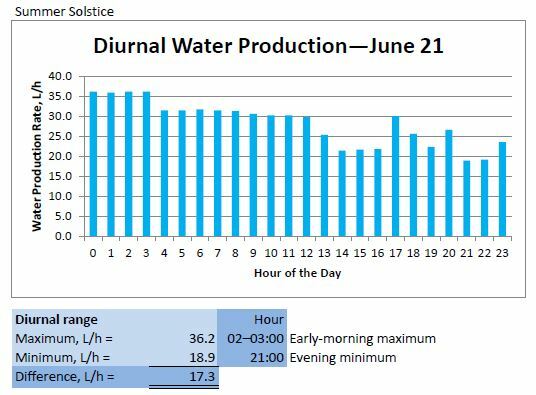 The hourly air temperature, relative humidity, and air pressure values enabled calculation of the hourly water vapour density (the water resource). I hope you found this tour interesting! The entire model output consists of 120 pages. Becoming familiar with how a water-from-air machine responds with its freshwater production to the hourly weather at a site is a unique experience that really helps make sound decisions about whether or not to use these machines in various drought situations. The San Francisco model shown here used weather data from 1993 because that was available as a free sample from a weather data vendor. Given the realities of climate change it would be interesting to run the model with 2013 data. I can run models for key drought locations in California. The price per model run report is [ask for quote] (USD). Please allow up to five business days for delivery as a PDF download. The Water-fom-Air Resource Chart for Praia, Cape Verde (click to enlarge). 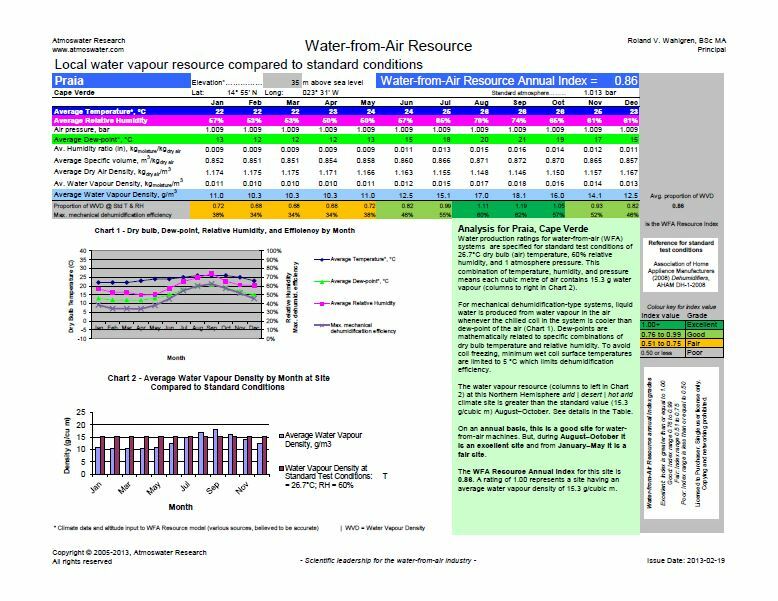 Why use a Water-from-Air Resource Chart? Well, this colourful output from a computer model is a marvelous tool for understanding how well water-from-air machines (atmospheric water generators; AWGs) would perform at your location. "Knowledge is power"--there is value to being well-prepared before talking to equipment suppliers, consultants, or project colleagues. Let me guide you through this information-packed chart. Local water vapour resource compared to standard conditions: At standard conditions of 26.7° C dry bulb temperature and 60% relative humidity and 1 atmosphere air pressure (sea level) there is 15.3 grams of water vapour in every cubic metre of moist air. The local water vapour density (the resource) may be less, equal, or greater. By using a standard it is possible to compare one location to another, compare one month to another, compare one hour to another, and so on. Elevation is an important input to the model because water vapour density normally decreases with altitude. Latitude and longitude are for reference—usually water vapour density decreases with increasing latitude north or south (moving from the equator to the poles). Monthly average temperatures for the location are obtained from various reliable sources. Monthly average relative humidity values for the location are calculated by the model once it knows the monthly average dew-points. Monthly average air pressures are calculated from the elevation information relative to the standard atmosphere at sea level which is 1.013 bar. Humidity ratio, specific volume, and dry air density are intermediate values the model needs to calculate the average water vapour density in kilograms of moisture per cubic metre of air. 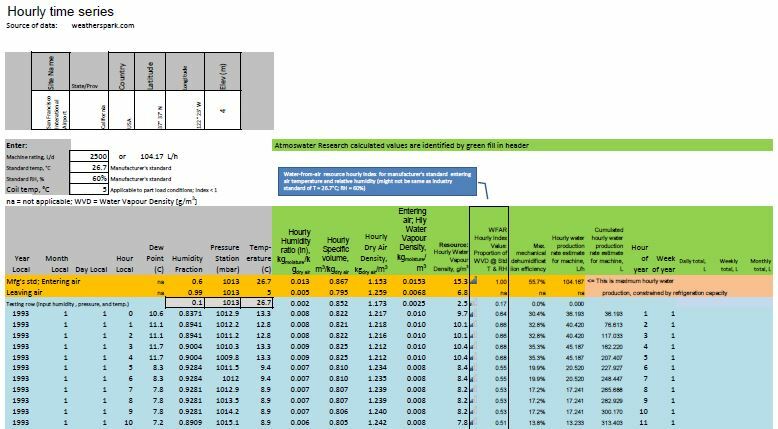 The highl﻿ighted-in-blue values of water vapour density have the units [g/cubic metre] to make the values easier to read and comprehend. A gram of water is represented by the 1 mL division on graduated cylinder laboratory glassware. Proportion of water vapour density (WVD) at standard temperature (T) and relative humidity (RH) = (monthly average water vapour density) / (15.3 g/cubic m); This proportion is also called the index value. Maximum mechanical dehumidification efficiency = [(average water vapour density - 6.8 g/cubic m)/(average water vapour density)] × 100%; Where 6.8 g/cubic m is the water vapour density of air at 5°C and 100% relative humidity at 1 atmosphere pressure—this models air leaving a wetted, unfrozen dehumidifier coil as being warmer than the freezing point of water and containing all the water vapour it can hold at the leaving temperature; The efficiency value is constrained to be less than 100% because in practice the coil temperature is regulated to 5­°C or above to prevent freezing of water onto the coil which causes overload and damage to the machine's compressor(s). 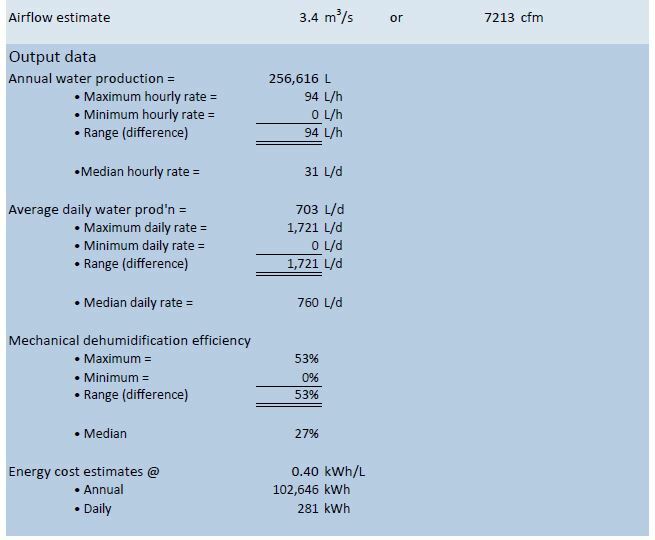 An exploration of maximum efficiency for mechanical dehumidifiers is found in an earlier blog post. Index value colours are applied to the index and efficiency values so the chart user can grasp at a glance the seasonal pattern of the water-from-air resource. The colour key and grade wording (excellent, good, fair, poor) for the index values is shown at the right-hand side of the page. The annual index value is the average of the monthly index values. Chart 1 is a month-by-month graphical display of average values of temperature (dry bulb), dew-point, relative humidity, and efficiency. Chart 2 is a month-by-month graphical display of average values of water vapour density (WVD; left blue columns) relative to the constant (right pink/red columns) standard condition WVD = 15.3 g/cubic metre. 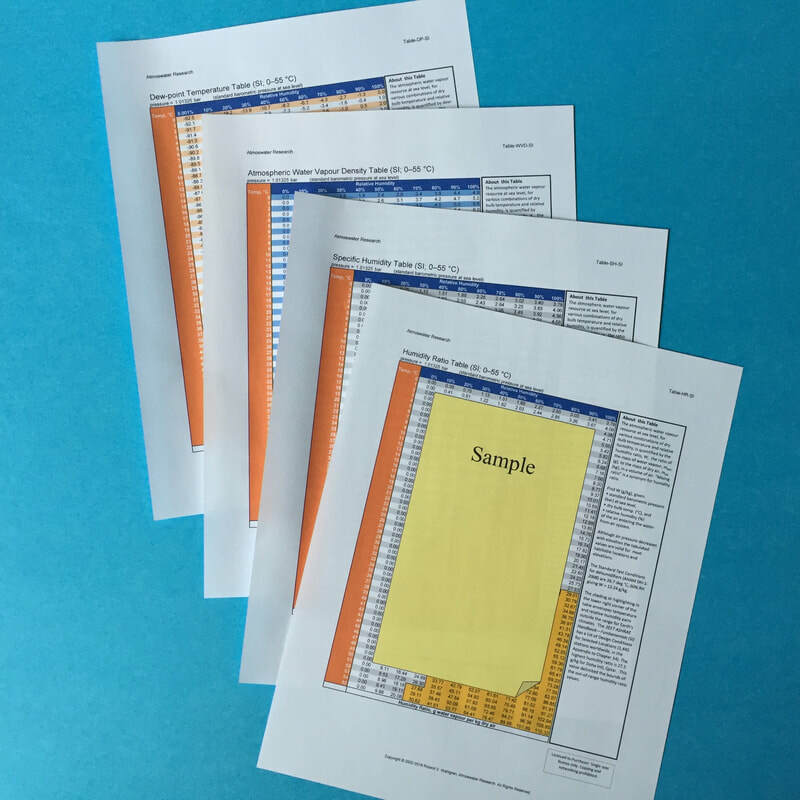 An analysis section for the location enables each chart to be a stand-alone document with a concise explanations about standard conditions, the dehumidification process, and efficiency. This section also identifies the location's climate zone and expresses in words how effective a water-from-air machine would be at the site throughout the year. Charts for many different locations are available from Atmoswater Research. You are welcome to ask me to produce charts for places of interest that are not listed yet.